The Riverside County Transportation Commission is updating both of its Riverside Metrolink stations to create a more user-friendly train experience. Work is starting this week on the Riverside-La Sierra Station, and work completed last week on the Riverside-Downtown Station. RCTC is mobilizing crews this week at the Riverside-La Sierra Station at 10901 Indiana Avenue to add 446 parking spaces, six bus bays, and a traffic signal to provide easier access to and from Indiana Avenue. The parking spaces will be added to an adjacent 4.7-acre vacant lot owned by RCTC that is northeast of the existing station, between State Route 91 and Indiana Avenue. Construction is scheduled to be complete in October. Work is expected to be limited to daytime hours. Lane closures may be needed to restripe Indiana Avenue, but no full street closures are planned. Residents may direct inquiries to RCTC at (951) 787-7141 or info@rctc.org. 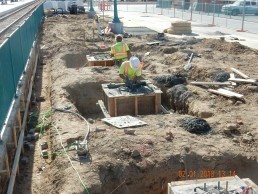 Improvements to the Riverside-Downtown Station at 4066 Vine Street began in September and include new Americans with Disabilities Act parking, relocated and upgraded ticket vending machines, and construction of three new bus bays, increasing the number to five. This work was completed April 27. The total cost to upgrade both stations is $5.1 million. Funding is provided by federal sources and property sale proceeds. Further east, plans are under way to add shade canopies to the three stations served by Metrolink’s 91/Perris Valley Line – the Riverside-Hunter Park/UCR Station, the Moreno Valley/March Field Station, and the Perris-Downtown Station. The shade canopies will provide a welcome respite from the sun as passengers wait to board the train. Canopy installation is scheduled to start this week and be completed by November 2018. The project construction cost is $2.5 million and is funded by federal grants and by Measure A, the voter-approved half-cent sales tax for transportation improvements in Riverside County.